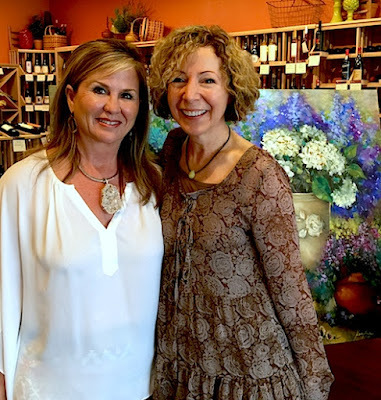 Spring Rain Peony and Hydrangea Garden is my newest large container garden, unveiled at my art event at Wine Down Market in Flower Mound Saturday. 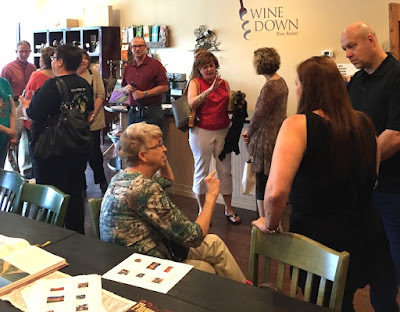 I'm humbled and honored at such a great turnout for the show! Thanks so much to everyone who joined me, and congratulations to Kay McCarthy who won a fun and squishable peony pillow. 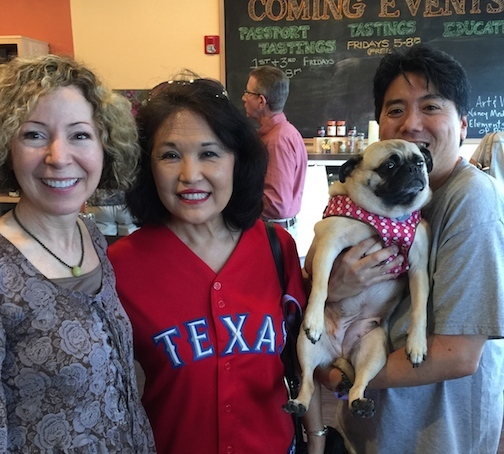 All the proceeds for the pillow giveaway went to one of my favorite charities, Dallas Ft Worth Pug Rescue. 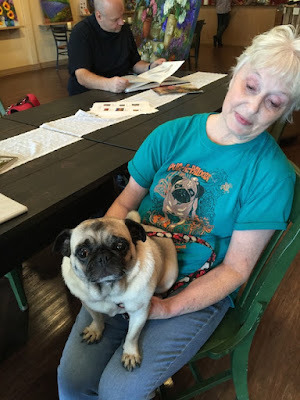 There were several quite good looking puggies who joined us for the event, four footed snuffly little ambassadors to the cause. I'll be having another art show at Wine Down Market again this year, right in time for holiday shopping, I sure hope you can join me there! 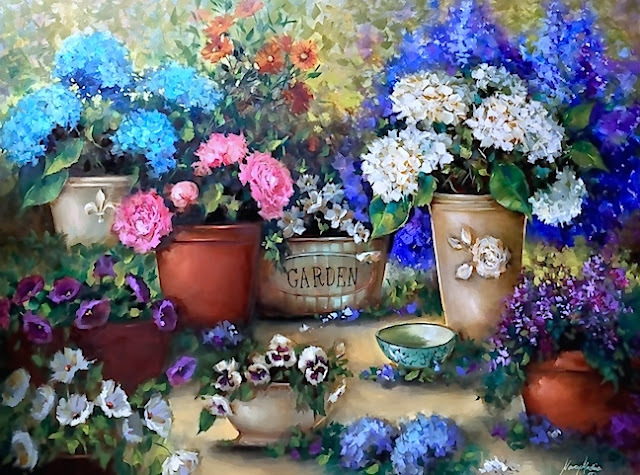 Sign up for my newsletter so I can keep you in the flower loop! Art and pugs, what a perfect mix! Great to catch up with friends! home with Don and Julie - hooray! A future flower painter arrives, hooray for Jodi! Milessa aka Miss Fashion Sense! 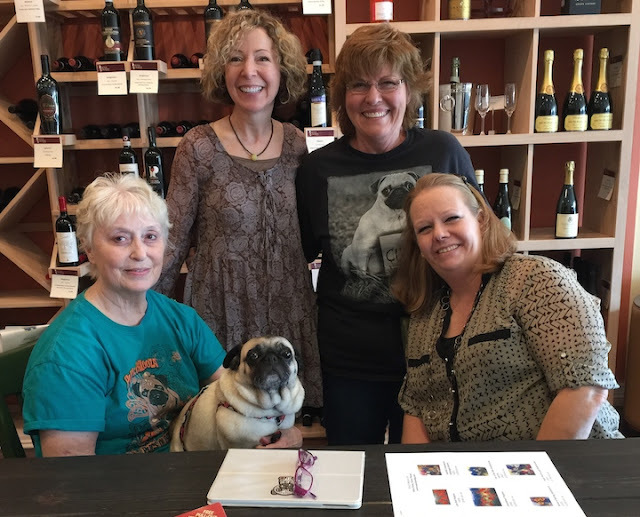 The pug rescue dream team, Jan, Karolyn, Cricket the pug, and Tammy!